When to buy nursing bras? This is a question we are often asked and the answer is surprisingly simple. Just prior to birth, your body will ready itself to produce milk. At approximately 8 months of pregnancy your breasts will be stabilized enough to get fitted for a nursing bra. This will most likely be your standard nursing size during the period you nurse or express milk. Your bra size can increase by 2-3 cup sizes. It is imperative that you are wearing a stretchy, supportive and comfortable bra during the first 3-4 weeks. After 4 weeks is when your milk will start to regulate itself, with your babies feeding amount and patterns. A structured, well- designed nursing bra will allow for these fluctuations to make sure that you are supported, comfortable and able to easily feed your baby too. It all depends on how much you feed and how often you wash them, what your activities are during the day and how many you would like. We suggest 3 for your breast feeding so that you can be wearing one, have one in the wash and one on the line. There are many different styles of nursing bras available in the market i.e. Seamless, contour, plunge, sports, non-wired, wired, spacer, sleep, fuller bust, soft cup and moulded cups. It is important to consider your lifestyle first before making a choice I.e. the types of clothes you wear, if you are active, a stay at home mum or if you go to work. These factors will help to determine the style of bra that will best work for you. It is important to know that immediately post birth there will be some engorgement, as the breast learns to regulate its milk supply. We do not recommend wearing a cupped size bra at this time, as the breast could feel compressed and restricted. Squashing your breasts into a bra that is too small could to cause conditions such as mastitis or some discomfort and pain. We recommend you wear only your seamless nursing bras for the first 4 weeks post birth. These are designed to stretch and grow with your changing body shape, providing support without restriction. From 4-8 weeks post birth, you breasts will return to the size they were at 8 months of pregnancy. This generally happens as the body has learnt just how much milk is required to feed your baby and it no longer produces excess. For nursing, it’s best to be fitted for your nursing bra after 4 weeks of feeding. Once the breasts have stabilized it is safe to wear a cupped sized bra, this may include a flexible wire option. A flexi-wire nursing bra will give you added support and a flattering shape. The flexible nature of the wire is designed to move with your body and is much more comfortable than a rigid wire found in mainstream bras. T-shirts or prefer a smooth profile from underneath clothing. 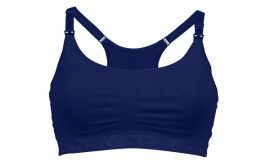 Contour cupped bras can be made from foam or a spacer fabric. The foam contour bra is made from a much thicker pad and has been traditionally been used in contour bras. Spacer nursing bra is a relatively new technology in fabric. A spacer fabric is much thinner and will mould to your body shape once warm, providing for a contoured profile without the bulkiness of foam. The spacer fabric is also incredibly strong and supportive providing a superior fit. It is important to understand and listen to your body. A bra should never feel restrictive, uncomfortable, dig in or feel too loose or too tight. Should you be experiencing any of the above symptoms it is advisable to go and visit a bra-fitting specialist in your area. Wearing a well-fitted supportive nursing bra is like having a best friend. You wont know what you did with out it! It is important to understand that not all bras are created equal. The fabrications, design and accessories used to construct bras are all different and the quality of the bra will be determined usually by price and the brand you purchase. During pregnancy and nursing our breasts change dramatically. Get fitted by a professional bra fitter to help determine your size and fit. Never purchase a bra that does not feel comfortable. If it does not feel comfortable on in the shop it will not feel comfortable at home. Uncomfortable bras are a waste of money and will end up sitting in your draw. Nursing bras should fit properly. Do not buy a bra that has extra room in the cups in hope that you will fill it out when your milk comes in. A bra that is too big in the cups will not support your breasts, which could result in premature sagging and discomfort. If the store does not have your size, go somewhere else. Do not be talked into buying a different size, as this bra will not support you properly. Avoid sacrificing quality for quantity. You are better off purchasing 3 good quality bras, then purchasing 6 cheaper bras for the same price. The cheaper bras will in time loose their ability to support as the fabrics and accessories loose there elastication.